If you’ve been watching the news here in Rhode Island these past couple of weeks, no doubt you’ve seen the damage that was caused by the coastal storms in Massachusetts. Homes and businesses that are near the water (which are similar to the area and homes here in nearby Narragansett, South Kingstown, Little Compton, Westport, Dartmouth, Stonington, New Haven, and Mystic) were damaged by the high tides and some even had foundations washed away due to erosion. While we don’t fix houses that have been damaged, here at Eastman Building Movers we CAN help before the storm. 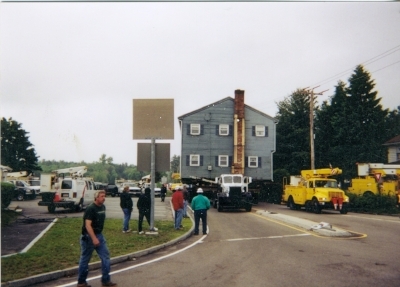 There are numerous reasons to move a house or structure to a new location, the first of which is to move it away from a flood plain or rising water. But what are some other common reasons? It frequently happens that an improvement project will cause zoning changes or a new bridge or highway must be built in an area that has been residential. This is similar to when the new Sakonnet Bridge was built in Tiverton and land was needed for the expansion. An option is for the homeowner to move the house to another lot, keeping familiar surroundings but in a new location. Sometimes, a historic buildings can be saved when zoning changes occur. Sometimes, a concrete foundation can fail and while the building structure is sound, staying on a foundation that is crumbling will cause further damage. You may have seen the reports of these crumbling foundations in Connecticut in towns such as Manchester, Tolland, East Lyme, and Stafford. In cases such as these, the house can be lifted and moved to a new location or the foundation can receive the needed repairs and the house can be re-placed on the corrected foundation. Sometimes a buyer finds their dream home, only to find that the view is less than ideal. The home can be moved to a new lot that provides the owner with everything they’ve wanted. Perhaps your dream home in East Greenwich isn’t in a peaceful area, but you found the perfect parcel of land to move the home structure to. The land can then be sold for another use or a new home. The key to all building moves is to preserve sound buildings and save them from demolition. Call Eastman Building Movers 401-885-4216 or email info@eastmanbuildingmovers.com to have your questions answered or to start the process of moving your building.